Remember Gallery 1988's gee-whiz Crazy 4 Cult show we mentioned yesterday? 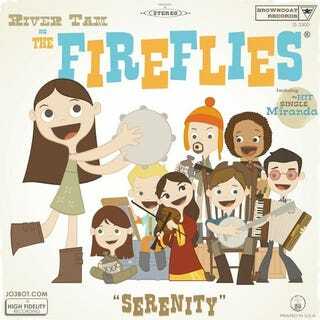 Here's a doozy from this year's show — the retro vinyl LP "Serenity" by River Tam and the Fireflies. Note: it's a Serenity-centric album, so there's no Jayne's Song. Since the soundtrack to Serenity wasn't actually released on vinyl, this record contains something special for whoever decides to purchase the full item from the gallery.